← The Spa Less Traveled: Discovering Ethnic Los Angeles. One Massage at a Time. This weeks kick is pumpkin spice! Now I know you are thinking to your self, “pumpkin spice is not a food” but before that inner dialog takes over let me just remind you that it’s edible -hence, it is a food! HA, ok-ok I know it’s a bit of a stretch, but in all fairness, I really do post about things I actually eat a lot of. With the holiday season here, pumpkin is in the air-or my stomach should I say. Pumpkin pie, pumpkin cheese cake, pumpkin bread, pumpkin soup, even pumpkin ale! But before you go thinking I’m binging on all this sweet garbage let me clarify- I’m not! 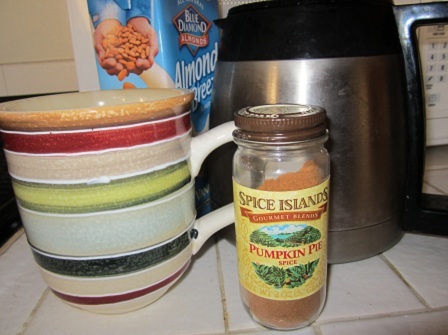 What I have been doing is putting pumpkin spice in my coffee! A little over a month ago I treated myself to a pumpkin spice latte at Starbucks- big mistake! Those things are oh so yummy and oh so fattening. I don’t want my inner fat kid to become my outer fat kid so I definitely can’t indulge in this as much as I’d like. After my NINTH trip to Starbucks in a month to have one of these it started to catch up with me (it’s definitely a slippery slope my friend)! I had to figure something else out. As I was shopping for some ingredients for Libby Lu’s Pumpkin Cheese Cake recipe, it hit me! 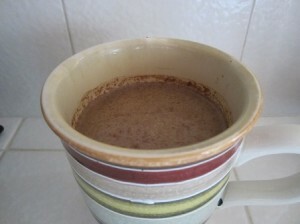 I put cinnamon in my coffee every morning, so why not pumpkin spice? I’m a genius! So I combined my usual cup of vanilla flavored almond milk, 4oz of coffee, a bit of pumpkin spice and VOILA (in my best French accent)! In your face, Starbucks! The creaminess of the almond milk combined with the sweet flavor of vanilla makes this a yummy latte for under 100 calories and only 15g of sugar. Starbucks’ no-whip, non fat milk version doesn’t even come close to this with a whopping 260 calories and 48 grams of sugar for just a 16oz cup. 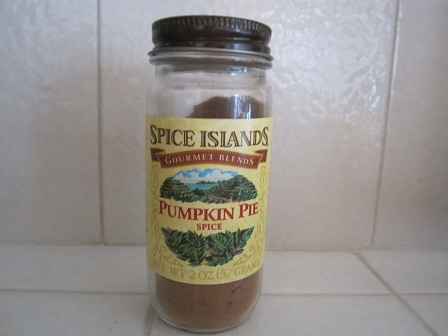 I also found that my pumpkin spice seasoning was particularly yummy in my plain yogurt this morning. I will now be able to get my pumpkin fix all year round! Cheers! Or mashed into a yam instead of eating pumpkin pie! So true Elise! I’ll have to try that tonight!